KLM Embraer ERJ-175STD (PH-EXP) Link departing to Amsterdam. Originally opened in 1937 when it was built as part of the Short Brothers and Harland Limited aircraft factory. 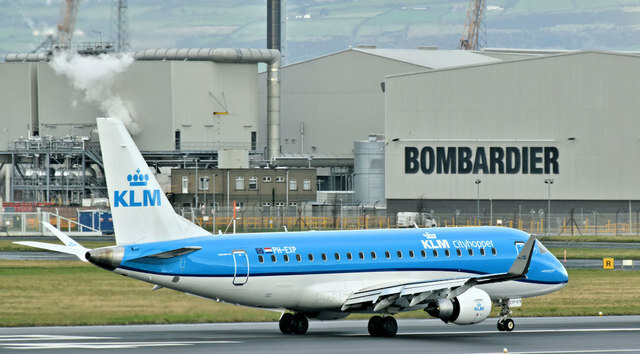 The present airport opened to scheduled passenger flights in 1983 as Belfast Harbour Airport. The terminal buildings were temporary ones – later extended and improved. The present terminal, close to the Sydenham bypass, opened in 2001. Aer Lingus operates to London Heathrow. Seasonal service to Faro and Malaga operated by ASL. British Airways to London Heathrow. Flybe to Aberdeen, Birmingham, Cardiff, East Midlands, Edinburgh, Exeter and Newquay, Glasgow, Inverness, Leeds/Bradford, Liverpool, London City, Manchester, Doncaster/Sheffield and Southampton with a seasonal ski charter to Salzburg in 2017/18. The airport is also used by a variety of operators for business and medical flights. This link is to the official City Airport website Link . The photographs submitted by me appear as a matter of neutral record only. I appreciate that many find the airport’s presence unacceptable. I have no connection with the airport or any group opposed to it. I cannot enter into correspondence or supply photographs for any purpose.